Stomach fire causing toothache, bleeding gums, swollen gums, nosebleed and ulcerations on the tongue or gums. Other symptoms may include headache, flushed cheeks, swelling and pain of the lips, fever, bad breath and constipation. Helpful in trigeminal neuralgia and periodontal disease are some of the imbalances satisfied clients have used this product for. Cimicifuga heracleifolia rhizome, Coptis chinensis rhizome, Paeonia suffruticosa root-bark, Rehmannia glutinosa root-raw, Angelica sinensis root, Activated carbon, Botanical wax, Talcum. 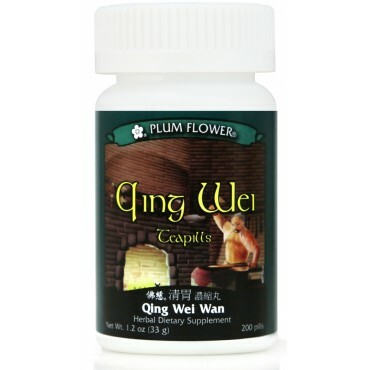 - Sheng ma, Huang lian, Mu dan pi, Sheng di huang, Dang gui, Activated carbon, Botanical wax, Talcum. Use with caution during pregnancy. Not for toothaches due to Kidney deficiency or attack of pathogenic cold.